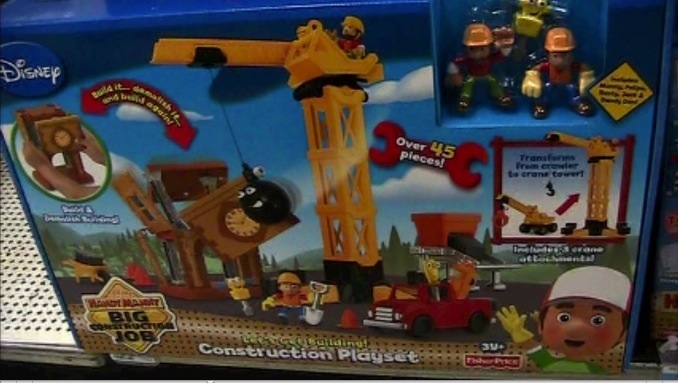 According to the report, the Let's Get Building: Construction Playset could present a choking hazard to children. Photo by Tyler Harris. The Public Interest Research Group, PIRG, is gathering signatures for a petition to protect children from dangerous toys that may lurk in the colorful gift-wrappings this holiday season. Toys with such harmless sounding names as “Dora the Explorer Backpack” and “Baby Doll” were among examples of products that it said contained potentially hazardous substances, while others such as “Lokmok/Baby’s First Train” or “Let’s Get Building: Construction Playset” were listed as examples of toys with potential choking dangers. According to the report, the Let's Get Building: Construction Playset could be a choking hazard to children. Photo by Tyler Harris. Roughly 250,000 kids went to the emergency room this year due to toy-related accidents, according to the public interest group, which is a national non-profit consumer advocacy organization. The group’s federal advocacy office said it has already sent a letter petitioning the safety commission. A more formal version, to be considered by law makers, will be submitted to the commission later this month. According to the report, the first safety overhaul by the commission since 1979 was the Consumer Product Safety Improvement Act of 2008. The act updated regulations for toys containing toxic chemicals. However, the research group, which is headquartered in Boston, said it is petitioning to update these standards again. The choking test should be made stricter, the report said, because they “continue to find toys with small parts that just barely met the safety commission’s standard” and are a choking hazard. Additionally, the report suggests more information is needed to determine the level at which exposure to toxic chemicals becomes unsafe. Current legal levels of lead, phthalates and antimony could be harmful. After testing over 200 toys and children’s products, researchers listed nine examples of toys they said either broke current toy safety laws or passed but were still considered hazardous. 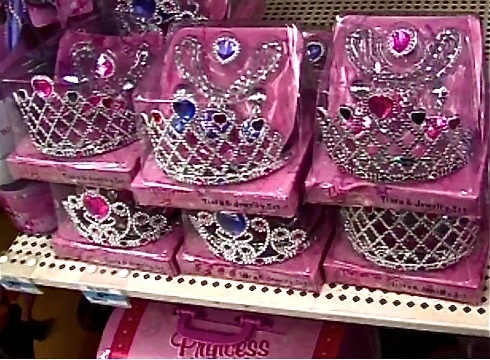 Princess tiaras, labeled potentially toxic by the study, line a K-Mart aisle. Photo by Tyler Harris. One toy, the sparkly purple and pink “Princess Expressions Tiara and Jewelry Set” by Almar Sales, met current requirements for lead but was labeled potentially toxic by the study. The study also reported a bright orange traffic cone from the “Let’s Get Building! Construction Playset” by Fisher Price is a choking threat, though it meets the law set in 2008. Pegs from HABA’s “Lokmock/Baby’s First Train” were listed for the same reason. Holiday shopper Dibny Diallo stood in the toy-filled aisle of K-Mart gripping the shopping cart that held her two-month-old child. The 24-year-old mother said she knows all about the dangers of tiny toy pieces. Though this injury proved to be non-life threatening, two toys on the shelves of the store where Diallo was shopping— labeled as “toxic” and choking hazards by the safety report—were available. The manager of the K-Mart, located on Highway 6 in Iowa City, would not comment on the Fisher Price construction play set or Almar Sales’s tiara and jewelry set located in the toy aisle. However, the manufacturer of the Princess tiara and jewelry set said in a press release, distributed the same day as the safety report, that the company is working to ensure its products adhere to state law. HABA, creator of the Lokmock Baby’s First Train sent out a similar response after the group reported HABA’s product as a choking hazard and included the story of a child who actually choked on a piece of the toy. The company said it is “100 percent committed to toy safety,” and meets or exceeds all U.S. toy safety standards. It added that HABA stopped shipping the train set to stores and filed a report of the choking incident with the Consumer Product Safety Commission. Lisa Orman, spokeswoman for HABA, said the toy, which met all current safety requirements, was unfairly targeted by the group. “It’s not cool the way they approached that,” said Orman referring to the report, which published a mother’s testimony of her child choking on a piece of the train set. However, the report also indicated that not all products on the market meet even the existing safety laws. Kids II Inc., creator of the Bright Starts Travel Book and, according to the study, the only U.S. manufacturer to not meet current regulations, did not return numerous phone calls and e-mails. The study cited Kids II Inc’s travel book for containing twice the legal level of antimony in the red handle of the book. Studies have shown animals that have breathed low amounts of the chemical over a long period of time acquired eye irritation, lung damage, hair loss, and heart problems. Higher levels were shown to cause fertility problems and lung cancer in animals. This could be surprising for parents like Diallo who said she considers books, like the colorful Kids II product, a safe toy for her kids. “They aren’t going to hurt each other with them,” she said.